Homeowners in Lake View Township (which includes all of the 46th and 48th Wards) may appeal their property tax assessment to the Cook County Assessor until May 6, 2016. Appealing your assessment is an opportunity to ensure your property tax bill is fair and accurate. 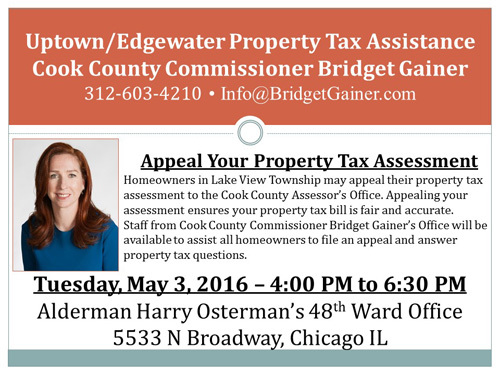 Staff from Commissioner Bridget Gainer’s Office will be available at Alderman Osterman’s 48th Ward Office to assist home in filing an appeal an answer any questions next Tuesday, May 3, 4:00 PM to 6:30 PM.